Picture this: That feeling you get when you give away almost 700 copies of your book for FREE, you rocket up Amazon’s free charts, you hit #1 in a few categories, everything is going amazing and according to plan, then you flip a switch the wrong way behind the scenes and it all comes crashing down on you? Yup, that was me just a few hours ago! Woo! 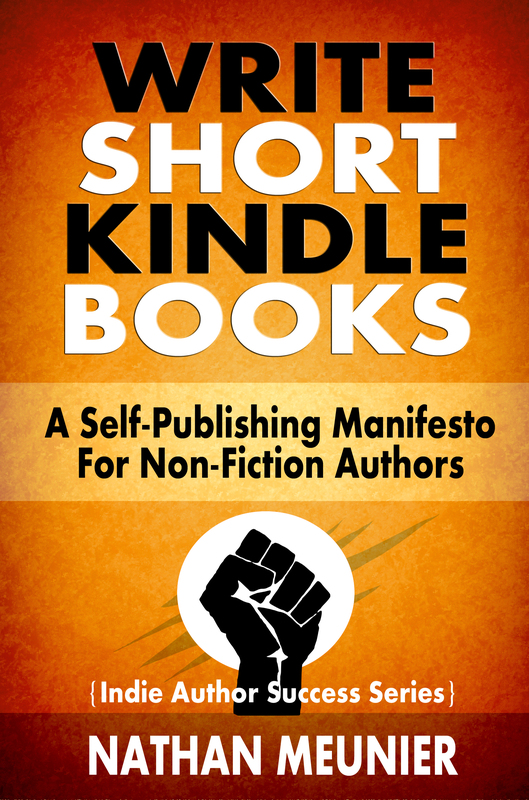 So my new book Write Short Kindle Books: A Self-Publishing Manifesto for Non-Fiction Authors launched a few days ago with a limited time FREE promo. People were downloading it. It’s received really positive reviews. And best of all, it pushed me to the #1 free bestseller slot in three different categories (note: not the same as #1 paid bestseller, which I probably could have hit if things hadn’t faltered). But yeah, that’s still AWESOME! The idea, was to give away copies to boost the book’s ranking on Amazon’s free charts, then at the end of the promo (basically when the downloads started to wane and before the rankings started slipping), the plan was to flip the switch during prime time hours — jumping to the paid charts and getting a nice boost of actual paid sales to make all the hard effort put into this launch worthwhile. DANGER! RED ALERT! AWOOOOGA! WE’RE GOING DOWN! You see, I flipped the wrong switch at the wrong time, ending my free promo instantly rather than having it kick in at the end of the day. This happened only moments after sending out a few tweets and Facebook group posts about the free promotion (I figured it’d take a few hours to kick back to the paid price). Yeah, NOPE! Not good! Once you end your free promo (which you can only do for a few days every 90 days), there’s no going back or resetting. I also made a slight downward price adjustment to $0.99 try to ease the strain of the slip-up — a price adjustment that prob won’t kick in until some time tomorrow, sadly. Apologies if that irks anyone who bought it at $4.99. I’m happy to kick you something free or one of my other books if you’re feeling exceptionally disgruntled. So the other snafu is that my book was sitting at the #1 free bestseller slot in its categories on the FREE charts, but showing a full price of $4.99. Here it sat in limbo for about two hours — killing all downloads and sales (and the ranking momentum too). There was absolutely nothing I could do but watch the screen in utter horror and wait, trying not to vomit in the process. I sensed that I had royally effed up, but didn’t know how bad the damage would be. Then it finally flipped over to paid, but by all sales and downloads had been null for a few hours. This basically bumped me off of all the charts. Meanwhile, I’ve burned through 3-4 solid days of social media cheerleading and promoting (something I always feel reluctant and awkward about doing), likely burning out most of my core audience on that in the process. It’s a thing you have to risk with a product launch, because no one else is going to do that grunt work for you (at least not until I get my author collective project off the ground). But still. So where does that leave me? Ergh. I gave out close to 700 copies of the book for FREE. Yes, cool, because hopefully those people will read the book, like it, and give enough of a crap to come back and leave a nice Amazon review. But also not entirely cool, because the prime directive was to use that momentum to help drive actual paid sales when it hit the paid charts. That isn’t going to happen, at least not the way it was supposed to. As of this writing, I’ve sold 4 paid copies? I’m hoping that changes in the days to come. I expect it will, but I basically have to start my book launch again from scratch — only this time at a setback because most folks aren’t going to want hear me yapping on about the book AGAIN for another run of consecutive days, and I can’t use my free promos or special KDP tools for another 90 days). Lame. It’s a sucky place to be in. I’m feeling pretty rankled by the whole thing. But I’m not giving up. In the grand scheme of things, this is only a minor blip — no matter how agonizing and catastrophic it feels at this very moment. I’ve had worse launches for sure. So Tomorrow (Wednesday), I’m going to start again. If you haven’t checked out the book yet, I’d certainly love it it you do so. I won’t feel bad if you wait until then to grab it. If you did pay $4.99 — thank you for your support, and yes, you can get a refund if you’re pissed about paying a few bucks extra. No hard feelings. If you did grab a free copy and enjoyed the book, that’s awesome thanks! I’d love it you’d stop by and leave a short review on Amazon. So that’s that! Why am I sharing this utter colossal eff-up with you all? Because why not? Every new book is a chance to experiment. This one was going well but went off the rails. Maybe I’ll try it again with another book in the series. Or maybe I’ll launch the next one at $0.99? Who knows, right? It’s all part of the (sometimes effed up but always enlightening and informative) self-publishing adventure. Cheers! Also, my new best friend Puppymancer and I thank you for your support! Well it wasn’t a TOTAL wash. At the very least you learned something NOT to do on your next launch. Plus in so doing you took an unfavorable situation and leveraged it to create something valuable for your fans with this post! Whenever you have another run at it I’ll be sure to do what I can to help build that momentum. Thanks! True that! I’ve got some plans in motion to hopefully salvage the month to at least maximize on the new book listing. Cheers! Is there any way you can parlay this snafu into something useful – say instead of apologizing for the sudden unexpected end to the free promotion, use it as a promotion for the next time it will be offered for free. Say something like, “Missed out on the free promo? Can’t wait till the next promo to read this awesome book – get it now at only $2.99!” and then mention when it will again be offered for free. Instead of offering a refund to those who purchased the book at the $4.99 price, offer them an incentive on your next book like a discount on it or an advanced copy or something like that? That way you aren’t giving a negative vibe to the book they already purchased and you are encouraging them to buy your next book. Also, if you would like to promote your book in 90 days when you have your next big sale, let me know and I will gladly do a feature or interview on the book. Good point! I’m shifting the price down very low for the month and giving that a try to see if I can rebuild lost momentum. A few folks prob have bought or will buy at the higher price until it switches over. I feel bad about that, but then again, they have options if they’re not happy with that, and anyone is free to get in touch directly too. Would def love to do an interview anytime! Don’t hesitate to get in touch if you’re still interested. Thanks! So effectively what you’re saying is that let the free promotions every 90 days run their course imtil the free promotion ‘timers’ are back 0 hours left. Is that correct? Like say for example if there 2hours and 45 minutes left on promotion (showing on the timers) then let this time finish to an end before starting to charge readers? Also did you provide the time/duration and exactly when the promotion. ends for your social media friends/followers? ? Like sort of deadline to take advantage of your free book? There are a few diff ways to run free promotions. You have up to 5 KDP select free days you can use either in a block or individually every 90 day period. One strategy is to run your free promo, wait until you’re ranked high in the free charts, then choose to “stop” the promo early at a prime time of day (usually good to let your audience know ahead of time). If done right, this can provide a nice boost in visibility, but things went a bit awry when I tried it and it didn’t trigger the way I expected. If you just let you free promotion run out naturally, it ends on midnight of the last day, which is a really crappy time to switch over because people aren’t buying a lot of books then, and you miss out on the boost. I actually recently went through similar stuff with my book (“In Sickness and in Hell” for anyone interested). There’s a couple things that you should look into more before your next effort, because based on my experience/understanding you’ve still got some misconceptions about how it works. 1) You already know this but to anyone reading, it’s important to understand that rankings are calculated HOURLY by Amazon. 2) Other than the “emergency” ending of a giveaway, there aren’t immediate changes in price. Amazon says something along the lines of at approximately midnight in their timezone the change takes effect, but may vary from that by a number of hours. My own scheduled “48 hour” giveaway start and stop times varied from what I had set. 3) According to Amazon, rankings achieved in the free categories have SOME impact on where it is ranked when it becomes paid again, but how much that impact is isn’t specified and from my experience it is not significant enough to keep you in the top books. This is more opinion than anything now, but from what I can tell being in the top 50,000 won’t get you any more sales than being #900,000. It’s the top 100 you’ve got to get into. While I like the idea of a free offer (especially since at the point my ebook released the physical copy had been selling well, so I offered this in part so people who had bought a physical copy could get the ebook for free too), in the future my plan is to release it for $0.99 for 48 hours. I won’t get as many “sales” of course, but the ones that I do get will count in the paid ranking just as much as a book selling for $10, hopefully pushing me up in a more useful way. I’ll reserve free offers for a year after launch or so, to reignite interest in my writing, hopefully close to the time I am releasing another book. For reference, here’s a summary of my experience: In 48 hours “In Sickness and in Hell” was downloaded by more than 620 people and reached #1 in its categories (by day 1) and peaked at #666 out of all Kindle books (which, since it has dark, religious undertones I have since used in marketing it further). As soon as it switched (as scheduled) to paid again, it dropped from #711 to #51,700. Just like Nathan, I used email notices and was very active on facebook during the sale period to spread the word and get friends and others to share the book offer as well. Wow this got long. The tl;dr version is: I’m happy to be able to say that my book was an Amazon #1 bestseller for literary short stories, but, I don’t think the free offer alone helps the rankings enough when it goes to paid to be as worthwhile as offering it dirt cheap (thus keeping it on the “paid” side) does. Hope that helps! Thanks for sharing your experiences, that’s great stuff! I’ve learned, and had an inkling of ahead of time from past experiences, that anything in terms of shifting prices or starting/stopping things on Amazon is a bit of a moving target, for sure. I ended the free promo earlier than expect, but def didn’t intend to end it THAT early. After reading some accounts of it taking a few hours to kick in, I figured I’d aim to have it switch over around prime time hours. The change from free to paid was almost instantaneous, but the real problem was that I never intended the $4.99 full price to be in effect immediately when switching over. The goal was to also lower that to an introductory cheaper rate, then gradually increase over the coming weeks until it’s up to full price. Got my wires crossed though, and the free promo ended yet the price change didn’t happen right away. It’s still a toss-up though, how long normal price shifting takes to trigger. I’ve had it take up to 12+ hours before some times, and other times it’s been a few hours. Def makes it challenge. You can move and adapt quickly, but not immediately for sure. Well aware of the hourly shifting/calculations, and I definitely figured that the free to paid chart bump wasn’t going to be 1:1 ranking wise (unless you do as you mentioned and crack the top 100 of ALL amazon). I hit in the 900s, so not quite there. Still, it was a good (albeit a messy one) learning experience. I’m dropping the price to $0.99 for the rest of the month, rebooting the launch, and just going to push onward for the next 30 days while the book is considering a “new release,” which will help drive some organic sales. It was featured in the first slot of “Hot New Releases” in the upper right corner of the Business Writing 100 bestseller category, so that sort of thing is helpful visibility-wise. I also picked categories that are relevant BUT also easy to rank in the top 100 in, so it shouldn’t be that hard to push back into upper charts within the book’s subcategories at least. Thanks again for the comments and insights! Always happy to talk shop and I enjoy hearing other people’s experiences. Great stuff! Forgot to add! I’ll probably try a $0.99 launch again with future books. This was an experiment since I’ve never run a free promo before, esp with a launch, andt this is my first book that has a bit broader appeal audience-wise. Would I do it again? Possibly, depending on the book. But I think even getting a small profit from a longer $0.99 run is probably more useful in the long-run.